The most famous European labyrinth is the great one set into the floor of Chartres cathedral, France, about 80 kilometers southwest of Paris measuring over 40' across. It is an extremely ancient device, as the story of the Cretan labyrinth shows. There was an Egyptian one at Hawara from about 1800 B.C., and if the idea hales from the Middle East it must be much older, for there is one at New Grange in Ireland dated seven centuries earlier. The labyrinth represents the world we live in, broad at the entrance, but narrow at the exit, so he who is ensnared by the joys of the world and weighed down by its vices, can regain the doctrines of life only with difficulty. It is not a maze, but a single way. It is not a mindless trick but an ordered track. The design used at Chartres was repeated in many other places including Lucca, and the Mappa Mundi in Hereford; and with embellishments at Amiens and St. Quentin. This is why the Chartres labyrinth is so important—it is a canonic arrangement approved by the clergy, repeatedly used from one end of Europe to the other, and placed in conspicuous places in their churches. The most important ingredients are: eleven concentric rings split into four parts, a path which leads from the outside to the inside and passes once over every track, and a picture or an inscription. Equally basic is the arrangement of the pathway. It always enters on the left of the center-line, and passes straight into the seventh ring counting from the inside; and it exits into the center from the fifth. This order is standard, as is the arrangement of tracks in between. The clergy at Chartres were famous for their Platonic scholarship, and ranked, in the century before the cathedral was rebuilt, as the foremost center in Europe for teaching these views. Beware, for love alone without knowledge, remains unfocused, unaimed, undirected. The consequences of such a love is pointless, leading to a confused state of perpetual 'Hallelujah' comparable to the village idiot's perpetual good humour. Through the medicine of knowledge joy is anchored so that love is directed to the Subject of all love. Eleven circles of Labyrinth represent the classic pattern of Evolution-Involution with the five steps in which God created the Universe followed by seven in which man finds his way back to Him. Aries to Leo covers the Creation of life and matter, Virgo is the creation of Man, and Libra is man in essence, his potential and his powers, including ego. Scorpio is man's notion of himself, his attachment to matter and self. It is the point of choice where the wrong decision will bring spiritual death. The last four signs depict the way back to God through understanding and spiritual consciousness, ending in Pisces whose sign is not unlike the dorjé/labrus itself. Aries is set a little apart from the others as the unformed flux of primal energy, preceding even the first breath of God, the Hu. Aries represents the ultimate whole. 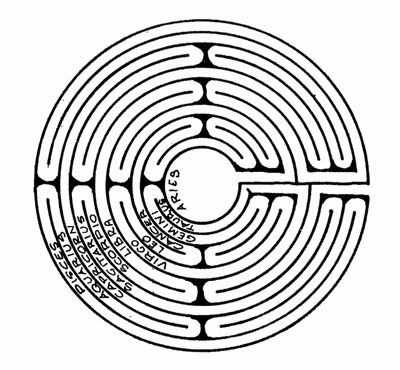 Only by placing Aries in the center of the labyrinth does the order of the paths have meaning. The innermost ring is therefore Taurus and the outermost is Pisces. The Way culminates in the First Strength of Aries seen as the Creative Principle surrounded by a six-petalled rose, and containing the repeat message of Ariadne/Mary giving the pilgrim/Theseus the thread/knowledge to conquor his desires and attachments, the Minotaur. Twelve has been the number of completeness at least since Sumerian times, for twelve months is the full cycle of the year whose twelve signs encompass the whole of human experience. It is closed and perfect in itself. The word 'Labyrinth' according to Graves comes from the pre-Greek work labrus which means a thing to be held, and in particular the double-headed axe. The sacrificial bull was killed with the labrus. The word has the same root as the latin lapis, ex the Greek la'as meaning stone or gem. It was used by the medieval alchemists to name the most important object of their search—the lapis philosophorum. There are aspects of these meanings held in common, and one link seems to be through the axe to a far more ancient symbol, which is certainly as old as Catal Hüyük eight thousand years ago. Zeus holds in his hand a thunderbolt, or so it was called and drawn in nineteenth century pictures. But the Greeks showed him holding something which sometimes looked like a dumbell, and even like the labrus. The word for it is keraunos, which is not the common word for thunder or lightening. The root may be kera to destroy, as Zeus used his powers as a sky god to annihilate his enemies—thought it could equally be related to ceremics (firing? ), the cornea of the eye (centre?) or to the horn. Indian and Tibetan mystics have a symbol called the dorjé, representing the perfect state where all the contradictions are united —masculine and feminine, right and wrong, yin and yang. This is the centre of the Hridayama around which all things move. Here the world of illusion (the so-called real world) vanishes and all energy is gathered together into its initial state. Is this symbol related to the Zeus thunderbolt? This point of perfect rest is called by the Chinese alchemists the 'Diamond Body', and in Hindu the 'Diamond Thunderbolt'. Thunderbolt? The diamond is the hardest stone and cuts all others, yet its transluscence is mobile, quick. It is full of light, yet solid—a symbol of durability; whereas the thunderbolt is the light and sound of heaven, the power without substance and the clap which awoke the universe. Here we have a host of interrelated connections: diamond, lapis, thunderbolt, axe and labyrinth. Though we have been taught to regard alchemy as primitive chemistry, from the twelfth century it was considered to be the study of the relationship between man and the cosmos. They believed that the processes man witnesses in heaven and on earth manifest the will of the Creator, and if correctly understood would yield the key to his intentions. The transmutation of base metals into gold was an esoteric symbol for their main objective, the transmutation of the soul. Like the Gnostic teachers of Chartres the alchemists sought God through knowledge. Mary Attwood, the famous nineteenth century alchemist, wrote that "Alchemy is philosophy, it is the philosophy, the finding of the Sophia of the mind." 'The first translators were Robert of Chester and Gerard of Cremona working in the 1140's half a century before the Chartres labyrinth. Now, when Royalty is crowned the king holds the orb, which is divided across the centre . Today it stands for dominion over the earth, but it used to mean more than this. But the orb is the sign for cinnabar, the most important ore in alchemy consisting of mercury and sulphur which Gerber implies are to be seen as symbols rather than as real. Pliny called it 'dragon's blood' and in the Middle Ages it was linked with the Uroboros dragon, a snake which consumes itself, and was the symbol of death and knowledge, of perfection and of power. It is circular, and consumes itself only to be reborn, and has much in common with the labyrinth. In the symbol of the orb lie all the meanings attached to cinnabar and to the uroboros, with the circle of completeness and the cross/square of the lapis. It is a symbol of unity—for the dragon had three ears and four feet (which is the same union of spirit and matter found in the serpent of the Kundalini which turns 3½ times before ascending the spinal chord). It is the union of three and four, which like that of the circle and the cross is the point of rest between the opposites. Here arises the Spirit in the Essence, and it stands thus (Drawing G included in Drawing 1 below).